- Studies on the organization of extracellular matrix synthesized by cumulus oophorus and its importance for the maintenance of oocyte fecundability. Role of the oocyte in the process of ovulation. Oocyte-granulosa cell interactions. Endocrine and paracrine regulation of follicle development. Analysis of knock-out mice for proteins involved in the organization and integrity of cumulus cell-oocyte complex extracellular matrix as well as in embryonic development and in pregnancy progression. - Studies on the biocompatibility of synthetic materials and their use as three-dimensional scaffolds for the maintenance and differentiation of embryonic and adult stem cells, in order to improve the in vitro culture conditions and, subsequently, to facilitate the in vivo recovery of damaged tissues. Studies on the biocompatibility and embryotoxicity of engineered nanomaterials variously substituted. - Identification and function studies on markers expressed by embryonic (ES) and adult stem cells. Isolation and characterization of ES-like subpopulations from cord and peripheral blood and from bone marrow. Antonella Camaioni took the degree certificate in Biological Sciences, with honours, in 1983, at the University of Rome “La Sapienza”. In 1989, she obtained the Ph.D. in Morphogenetic and Cytological Sciences at the University of Rome “Tor Vergata” discussing a thesis on: “Sperm cells as vectors for introducing foreign DNA into eggs: genetic transformation of mice”. During her doctorate and, after that, till 1991, she was studying the process of mammalian fertilization, mainly focusing on eggs and sperm interaction with components of the extracellular matrix. From 1989 to 2002, she was Assistant Professor in the Department of Public Health and Cell Biology at the University of Rome “Tor Vergata”. From 1991 to 1994, she spent a sabbatical at the National Institutes of Health (Bethesda, MD, USA), in the Proteoglycan Chemistry Section directed by Dr. V.C. Hascall. In that period, she continued to be involved in biology of reproduction studies, in particular on the characterization of the extracellular matrix that is organized around the oocyte by the cumulus oophorus before ovulation, both in terms of proteoglycans and hyaluronan content. In 2002, she became Associate Professor of Histology at the University of Rome “Tor Vergata” and this is her present position in the Department of Biomedicine and Prevention of the same University. In recent years, by utilizing knock-out mice, she has been studying the function of specific proteins in the organization of the cumulus cell-oocyte complex extracellular matrix as well as in embryo implantation and development. 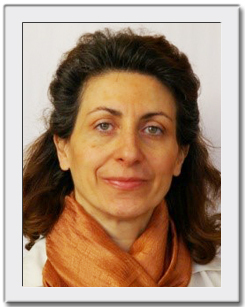 Since 2006, she has also been involved in embryotoxicity and biocompatibility studies on variously functionalized nanomaterials and their use as tridimensional scaffolds for the maintenance and differentiation of embryonic and adult stem cells, to improve in vitro culture conditions by mimicking the characteristics of the extracellular matrix, with the perspective to utilize such scaffolds for tissue regeneration. Lehmann G., Cacciotti I., Palmero P., Montanaro L., Bianco A., Campagnolo L., Camaioni A. Differentiation Of Osteoblast And Osteoclast Precursors On Pure And Silicon-Substituted Synthesized Hydroxyapatites. Biomedical Materials, 7(5):055001, 2012. Pietroiusti A., Massimiani M., Fenoglio I., Colonna M., Valentini F., Palleschi G., Camaioni A., Magrini A., Siracusa G., Bergamaschi A., Sgambato A., Campagnolo L. Low-Doses Of Pristine And Oxidized Single Wall Carbon Nanotubes Affect Mammalian Embryonic Development Acs Nano, 5(6):4624-33, 2011. Nagyova E., Camaioni A., Scsukova S., Mlynarcikova A., Prochazka R., Nemcova L., Salustri A. Activation Of Cumulus Cell Smad2/3 And Epidermal Growth Factor Receptor Pathways Are Involved In Porcine Oocyte-Cumulus Cell Expansion And Steroidogenesis Molecular Reproduction And Development, 78(6):391-402, 2011. Moscatelli I., Pierantozzi E., Camaioni A., Siracusa G., Campagnolo L. P75 Neurotrophin Receptor Is Involved In Proliferation Of Undifferentiated Mouse Embryonic Stem Cells . Experimental Cell Research, 315(18):3220-32, 2009. Bianco A., Di Federico E., Moscatelli I., Camaioni A., Armentano I., Campagnolo L., Dottori M., Kenny J.M., Siracusa G., Gusmano G. Electrospun Poly(Ε-Caprolactone)/Ca-Deficient Hydroxyapatite Nanohybrids: Microstructure, Mechanical Properties And Cell Response By Murine Embryonic Stem Cells . Materials Science And Engineering C, 29:2063–71, 2009.